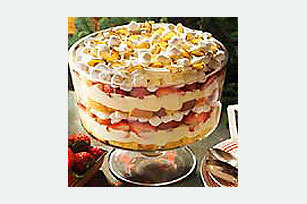 Similar to a classic English trifle, this pretty dessert features layers of pound cake cubes, vanilla pudding, fresh strawberries and marshmallows. Beat pudding mix and milk in large bowl with whisk 2 min. Gently stir in 2-1/2 cups COOL WHIP. Layer half each of the cake cubes, pudding mixture and strawberries in 2-1/2-qt. serving bowl; top with 2-1/4 cups marshmallows. Repeat layers of cake, pudding mixture and strawberries. Top with remaining COOL WHIP; sprinkle with nuts and remaining marshmallows. Cover. Substitute 1 can (16 oz.) sliced peaches, drained, for the strawberries. Prepare using JET-PUFFED Miniature Marshmallows.